Theresa May: Facing another defeat? British MPs have passed a historic legislation to delay Article 50, forcing the Prime Minister Theresa May’s government to set out its timetable for the length of the Brexit delay in order to prevent the UK exiting the European Union (EU) without a deal. The EU Withdrawal (No 5) Act passed its final stages in the House of Lords just after 11 p.m. on Monday, forcing May to extend Article 50 — the legal mechanism through which Brexit is taking place, reports the Guardian. The legislation devised by opposition Labour MP Yvette Cooper and the ruling Conservative party’s Oliver Letwin was earlier approved by the Commons on Monday evening by 392 votes to 85 – a majority of 307. Under the terms of the new act, the government must table a motion to agree the length of extension the Prime Minister will seek from the EU. The swift passage of the legislation, which took just three sitting days to complete, was made possible by the success of an unprecedented amendment which allowed MPs to seize control of parliamentary business on particular days, meaning the government could not block its progress. 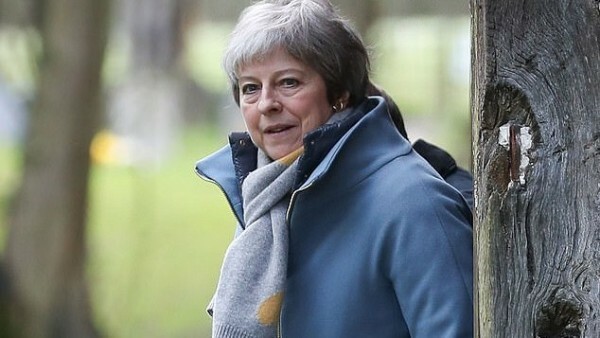 May has already pledged to seek an extension until June 30 but the government opposed the legislation, fearing the precedent it would set for the Backbenchers (MPs who are not ministers or shadow ministers) to be able to pass bills. On Monday night in the wake of the bill’s approval, the government tabled its motion setting out May’s intention to seek an extension until June 30. That is set to be debated and potentially amended in the Commons on Tuesday. “We are committed to finding a way through in order to ensure we can leave the EU and deliver on the referendum. That will require the parties to work at pace in order to address outstanding issues — and so ministers and their shadow counterparts will be holding talks (Tuesday),” CNN quoted a Downing Street spokesman as saying. Meanwhile, May will meet German Chancellor Angela Merkel and French President Emmanuel Macron on Tuesday ahead of her meeting with EU leaders on Wednesday night to discuss the embattled Prime Minister’s request to move the Brexit deadline, which is set for Friday, April 12. The European Union’s (EU) chief negotiator for Brexit Michel Barnier has said that Ireland has the “full support” of Brussels and emphasised that all community members “remain united” in their stance vis-a-vis the UK’s departure from the bloc. Barnier’s remarks came on Monday here after a meeting with Irish Prime Minister Leo Varadkar less than 48 hours before the start of the EU summit at which the bloc will consider the idea of granting London an extension of the date by which it must break with the European bloc, Efe reported. The 27 countries that will remain in the EU after Brexit on Wednesday will discuss the possibility of delaying the UK’s withdrawal beyond the previously scheduled date of April 12, a decision that must be unanimous. “One thing is certain — whatever happens, the EU will stand fully behind Ireland. You have our full support,” said Barnier at a press conference with Varadkar, who last week had obtained similar guarantees in his meetings with German Chancellor Angela Merkel and French President Emmanuel Macron. The Irish leader said that he believed it to be “extremely unlikely” that any of the EU member nations would reject giving London an extension, although he added that the British government must present a detailed action plan. Conservative British Prime Minister Theresa May had asked for an extension until June 30, although some EU partners, including Ireland, prefer to provide an extension of up to a year. With the additional time, May thinks that she will be able to work with her political opposition to design a roadmap that will allow the House of Commons to ratify the Withdrawal Agreement that she agreed to with Brussels in November 2018, but which has been rejected by Parliament three times, primarily over the question about what is known as the Irish backstop. In line with Berlin’s stance, Varadkar said Monday that he was against a short extension because that could create “more indecision and uncertainty,” while flexibility in the time period would permit May to negotiate with the main opposition Labor Party an agreement that has the support of Westminster. Paris, on the other hand, seems to be leaning toward a short extension — perhaps of just a few weeks — if London’s proposals at the Wednesday summit are not convincing, a situation that could end in a “no-deal” Brexit. In that scenario, Barnier said on Wednesday, the 27 EU partners agree that a backstop is the “only solution” to avoid a hard border between Ireland and Britain’s province of Northern Ireland. The EU negotiator insisted that the Dublin government has the “full support” of all the other EU members in that regard, but they acknowledge that the security mechanism is key for protecting the economy of the entire island, which is highly integrated, and the peace process in Northern Ireland. Therefore, the former French Foreign Minister warned that if a no-deal Brexit results, London and Brussels would not open negotiations on their future trade relationship as long as the future of the Irish border is not resolved first. In his opinion, it is possible to achieve an arrangement that protects the 1998 Good Friday Agreement that ended decades of strife in Northern Ireland between pro-British Unionists and Irish nationalists. The mentioned safeguard allows the UK to remain within the customs union and for Northern Ireland to align itself with certain norms of the EU Single Market until a new trade relationship between both parties can be established, a process that could take years. The more Euroskeptical wing of May’s Conservative Party and the rightist Democratic Unionist Party, based in Northern Ireland, say that that mechanism puts the territorial and economic integrity of the entire country at risk.